It’s time for your non-profit’s annual fundraiser. This year, instead of an indoor gala at a high-end venue, you’d like to host attendees at the very gardens they are pledging to support. Focused on education and preservation, your foundation’s property is flush with beautiful native plant life along a magnificent human-made lake. This year’s fundraiser is specified to fund maintenance of the lake, and so your team has envisioned setting up the event lakeside. The only problem is the area is uncovered and is unequipped to host a meal for over 100 guests. 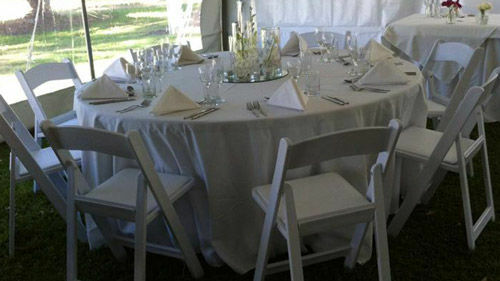 Table and chair hire in Sydney is a breeze with Outwest Party Hire. We have the perfect party table for hire to suit any occasion which can be paired with as many chair for hire as you need. Your equipment is delivered promptly throughout Sydney by our exceptional staff. We’ve been in the business of supplying table and chair hire to suit occasions large and small for more than 20 years. From extravagant weddings to backyard birthday parties, we take the stress out of hosting with our high-quality rental equipment. Our comprehensive stock of event equipment includes everything from table and chair hire to stages, dance floors, marquees, heaters, and linen, and more! Don’t waste your time with vendors that only offer some of what you need. Shopping for individual pieces, such as party table hire in Sydney, is time-consuming and more expensive. Then you’ll have to worry about each vendor arriving on time with the completed order. If that weren’t a headache enough, what happens when they make a mistake, are late, or don’t have enough of the item they promised? Outwest Party Hire has the experience necessary to ensure your event is handled with care and is provided top-quality party table and chair hire to impress your guests thoroughly. When you visit our online store, you’ll find information on various styles of table and chair hire available for your Sydney event. We make it easy to stay within your budget by listing all our prices. Our galleries allow you to see our previous work and get ideas for how to make your fundraiser comfortable and memorable. When putting together an event, it’s easy to remember the tables and chairs and just as easy to forget the supporting equipment needed to make the function comfortable. Have you considered shade and shelter? A peg and hole or free-standing marquee will protect your guests from the sun and the food from wildlife. Subject to being overtaken by the wind when not installed correctly, we ensure skilled delivery and placement. Do you have flooring in place so that those in heels don’t ruin their shoes or your lawn? While other vendors may stop at table and chair hire, Outwest Party Hire is here to supply equipment for every aspect of hosting your event so that even those last-minute needs are no problem.